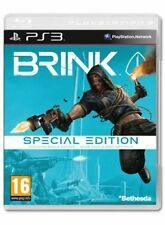 Brink -- Special Edition (Sony PlayStation 3, 2011). Condition is Good. Dispatched with Royal Mail 1st Class Large Letter. Brink - PS3 PlayStation 3 Sony Game & Case. Condition is Good.minor scratches. Dispatched with Royal Mail 1st Class Large Letter. For Sony Playstation 3. Xbox 360 & One. We are here to help if we can. Everything is tested if needed. Vehicle Accessories. Certificated 18 . Tested & Working. Box & Disc. Sony PlayStation 3. WITH MANUAL. Special Edition. 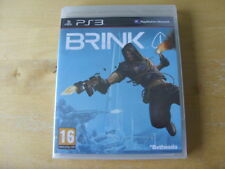 BRINK FOR PLAYSTATION 3 IN CASE WITH MANUAL. Manual – 9/10. Tested and working. Stating what product (s) you’re interested in and what country you’d like them sent to. Press the green follow button to keep up with all the new titles coming in. “Excellent friendly. great communication. Platform Sony PlayStation 3. Genre Shooter. Brink Special Edition PS3 Game In Box With Manual. WITH box and artwork / book. DISC ON very good CONDITION. However, occasionally an item may arrive and not work properly. We are always willing to work things out. See photos for details of the actual item. Brink allows you to seamlessly move between your single player campaign, co-op with friends, and intense multiplayer action. Multiplayer takes the story online where you can play with up to seven other people (or AI characters) cooperatively as you take on the opposing faction or with up to 16 players competitively. Platform Sony PlayStation 3. NON CONTINENTAL USA AK / HI / PR / APO / FPO / & OTHER US TERRITORIES. EAN 093155124479. MPN No aplicable. PlayStation 3. Complete, excellent condition. 9 place of the Couarail.